Wouldn’t you hate to be the guy at the National Security Agency (NSA) reading all the lame Facebook posts trying to find evidence of terrorist activity or foreign espionage? OK, so it’s probably not some guy analyzing petabytes of data over at the NSA, but still, it’s got to be a thankless job. Even a super computer would turn its digital nose up at some of the Tweets floating out there in cyber space. The outrage over the NSA’s Internet monitoring reached a fever pitch this week with a special Fourth of July online protest. The NSA’s online information collection program leaked by former government contractor Edward Snowden caused ripples of anger and anxiety around the world, sparking a renewed interest in privacy. There’s seems to be an inherent irony here: people are angry when they think the government is collecting data on them, but they freely broadcast personal information through social media on a daily basis. Much has been written about how to protect your private personal information online. What’s difficult to reconcile is why we ignore these warnings when posting to Twitter, Instagram or Facebook but feel so violated when we think someone may be spying on us. Even Maxwell Smart could find out all he wanted about us by reading the information we post daily on Facebook. There was a time, particularly in the South, when people valued privacy so much that they went to great lengths to maintain “appearances.” In those days, language was cloaked in euphemism to cover any embarrassing revelations. Such a conversation from, say, 40 years ago may not even be recognizable today. Can you guess what really happened from that exchange? Probably, but it’s certainly not flaunted or celebrated. I’m not downplaying the seriousness of the NSA program, but it is worth asking whether it is more personally harmful to know that an email was sent from your IP address at 11:15 a.m. on March 23, 2008, or that you have a binge drinking problem? In recent weeks, I have been attempting to expand the Twitter presence of New South Essays. A quick scan of Twitter these days is enough to send the Church Lady into spasms of shock and condemnation. Because people place such importance on authenticity, they strive to “keep it real” when posting to social media. When you mix in an absence of inhibition, you have a recipe for over-sharing. In the New South, we tell everything without reservation and hope to get a few “likes” or “shares” out of it on our social media platforms. I am a public relations practitioner. It is my job to think about how messages reflect on individuals and organizations. I certainly value authenticity and honesty, but I do wonder just how all of this personal revelation will serve us down the road. Has anyone Tweeting the details of their love life considered this possible future conversation? And that’s ignoring the present possibility of potential employers seeing how you spent your weekend or what you really think of your supervisor. Sometimes an ounce of discretion can prevent a pound of humiliation. Now, excuse me, I have to go to the doctor. You see I’ve got this rash on my backside that is shaped like Oklahoma. What are your privacy standards? 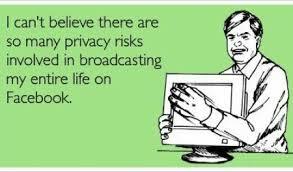 Are you concerned about what you reveal about yourself online? What is the line you won’t cross? Have you ever posted something on social media and have it come back to haunt you? Join in the conversation and share your thoughts below. I’m sure the NSA will get a kick out of it. This entry was posted in Uncategorized and tagged contemporary South, Edward Snowden, Facebook, Fourth of July online protest, Instagram, Lance Elliott Wallace, Lance Wallace, Maxwell Smart, New South, New South Essays, NewSouth, NSA, online privacy, oversharing, protecting persional information, social media, South, Southern, Southern Culture, Southerners, the Church Lady, the South, TMI, Twitter. Bookmark the permalink. Twitter strikes me, a polite North Carolinian, as particularly unbridled and prone to extreme statements. You want people to pay attention to you and you have 140 characters to use. So throw in the profane, the lurid, the hair-raising, and you’re on your way. I would love to find calm, mature, polite folk to follow. But maybe they’d bore me!